Keeping your pet safe from poisonous insects, animals, plants, and other environmental and home hazards requires a mix of education, common sense, and planning ahead. The first step is to "pet proof" the house and yard, just like you might for a toddler, because pets are often just as clever at getting into things they shouldn't. Make sure that all chemicals, medications, food, "toys," and garbage are out of reach of your pet. Dogs are notorious for eating things that smell good or look like toys but aren't. Every year veterinarians remove countless nylons, peach pits, corn cobs, coins, diapers, super balls, and many other items from the stomachs and intestines of dogs. For cats the worst culprit seems to be strings and other similar materials, which get caught under the tongue despite being swallowed and cause the intestine to scrunch into a little ball trying to move the string through the intestinal tract. Ethylene glycol (found in antifreeze) is a particulary dangerous household poison. It tastes sweet and ingestion of even a very small amount can cause acute kidney failure and death in dogs and cats. There is an antidote for ethylene glycol toxicity (dogs only) but to be maximally effective it must be given within a few hours of ingestion. (You can read more about Antizole, an antidote for ethylene glycol toxicity courtesy of the drug's manufacturer at www.petplace.com). Unfortunately, for those dogs already in kidney failure, the antidote is ineffective; a prolonged hospital stay will be required for recovery. A number of outdoor plants and house plants are also toxic to animals. Many plants are just gastrointestinal irritants and cause vomiting. Others are far more dangerous. One example is the Easter Lily, which can cause severe and often fatal kidney failure. There are two main types of rodenticides that are toxic to animals. Anti-coagulant rodenticides are the most common. They interfere with the activation of several factors in the clotting system and the poisoned animal can bleed to death. The other type of rat and mouse poisons that cause toxicities in dogs and cats are vitamin D rodenticides. Large quantities of vitamin D cause massive increases in the blood calcium and kidney failure. Over-the-counter and prescription drugs intended for humans should not be used in dogs or cats except upon the advice of that pet's veterinarian. 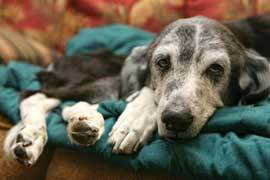 Some drugs that humans use routinely are highly toxic in pets. One example is acetominophen (Tylenol), which is highly toxic in cats. The drug damages feline hemoglobin rendering it incapable of carrying oxygen. As many people know, chocolate is toxic to dogs. It contains theobromine, which is toxic to dogs in sufficient quantities. It takes, on average, a fairly large amount of theobromine (100-150 mg) to cause a toxic reaction, although there are variables to consider like the individual breed's sensitivity, animal size, and chocolate concentration. For example, two ounces of milk chocolate will normally only cause digestive problems, but two ounces of Baker's chocolate can cause great risk to a 15 pound dog. The last step in "pet proofing" your house is to ensure that you have the telephone numbers for your veterinarian, emergency clinic, and local poison control center readily available. In case of emergency you can contact the California Poison Control System at (800) 222-1222 or visit their website at www.calpoison.org to learn more.